I have seen hundreds of casino gambling websites, and just like land based casinos, there are good ones and not so good ones. I have written reviews for a few of the ones I have played at. I can only speak from personal experience, but each of these online casinos has treated me fairly and professionally. If you are just looking for a place to play free casino games, any of them will work just fine. You will find that 98% of online casinos will offer free games for people who just want to play for fun or learn the casino games. If you want to play for real money, you need to gamble somewhere safe, and that is why I offer these reviews. Never gamble online somewhere that you are not familiar with. Don’t just read casino reviews because half of them are paid for by the casino. You will want to check out the popular casino forums and read where other actual player make their deposits. Even the casinos that seem really reliable and have been around for years can turn rogue. Some examples of this are GoldenCasino.com, OnlineVegas.com, CrazySlots.com, GoCasino.com, EnglishHarbour.com, MillionaireCasino.com, VIPSlots.com, SlotsGalore.com and SuperSlots.com to name a few. What you will see in all of these cases is that the casino is now closed and the website has either become a portal for other casinos or has been disconnected altogether. The last thing you should do is follow the advice of one of those defunct casinos’ portal listings. Here is a big hint to all of you gamblers: Whenever a casino portal lists a brand new online casino as one of their top sites, it’s because they want to get credit for you as a customer because they are an affiliate of the casino. Most people don’t clear their Internet cache very often, so it’s first clicked, first credited as far as the affiliate software is concerned. 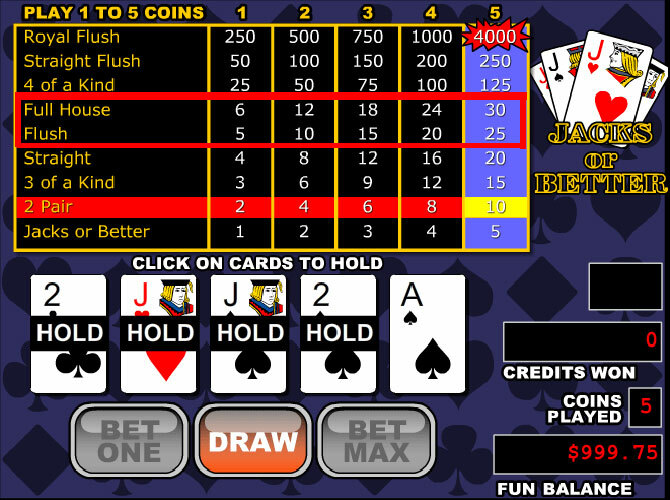 If something looks wrong, it’s because the payouts for Full House and Flushes are supposed to be 9x and 6x respectively. Any online casino that messes with the payouts shouldn’t be played at period! The other thing you should look into when playing online for real money is if the casino offers any kind of sign up deposit bonus. If they do, there is no reason not to take advantage of the free money, but you MUST read the terms and conditions of any bonus before accepting it. Some of them do not let you play games like blackjack or video poker if you accept a bonus. Any online casino that does not clearly state the rules for their bonuses or tries to hide the terms and conditions should not be played. This includes any casino bonus that states there is a 30x rollover, but then hides the fact that wagers on blackjack and other games only count for 10% towards the rollover. Always look for the following statements which indicates that the bonus money cannot be withdrawn: “For wagering purposes only”, “Non-cashable bonus”, or “Bonus money will be removed upon withdrawal”. In some cases, these types of bonuses are fair when they are trying to give you a bankroll to work with. In those cases, there won’t be any complex language in the terms and conditions regarding the wagering requirements. Any casino bonus that appears too good to be true … is too good to be true! Either the wagering requirement will be high enough that you are likely to lose your deposited money, the money you deposit will be used before the bonus money which can’t be withdrawn, or there are complex rules that can void the bonus and any winnings if you try to make a withdrawal. The general rules with bonuses are: no percentage higher than 200% for slots, no percentage higher than 100% for table games, no dollar amount higher than $500 for a single deposit with slots, no dollar amount higher than $250 for table games. Anything that I’ve personally seen that does not meet that criteria is a complete waste of time/money. Which Casino Should I Deposit Money At? Like I said before, you need to make an educated choice and research the casinos beforehand. Listening to other gamblers at the major casino forums is the key. The most common complaint is not that the games are fixed. The most common complaint comes when it is time for the casinos to pay you your winnings. Either they take too long so you have a chance to lose the chips back to them, they try to void your winnings for breaking some obscure rule that they don’t list, or they simply stop paying customers. Currently, my favorite choice is www.Bovada.lv. This is strictly my personal opinion and preference because they are the quickest site to pay out winnings. You will notice that I didn’t put an affiliate link on there, nor do I have dozens of banners pimping Bovada, because I’m not trying to bilk you out of your money. Lastly, beware of the banners. If there is one thing that we have learned over the past 10 years, it is that all banners and text ads on the sidebars and navigation bars are paid for. They make money when you click on them. Google has made billions of dollars per year doing this on millions of websites. Don’t let them make up your mind for you. Do the research and find real people who aren’t getting paid to say what they are saying. I am a big online slots player. They are the perfect combination between relaxing and exciting. I was looking for a change of pace today and looked into the Specialty Game section at Slots LV. There I found Virtual Racebook 3D and now; I think I have a new pastime. As you can see the graphics are so real that I feel completely justified in rooting for my horse. It feels different from other online casino games where it’s just a matter of where the gaming software lands. Don’t get me wrong, that’s exactly what this is, but it feels more real-life, and therefore, more exciting. I’ve never “gone to the track” before, so I’ve never seen a betting slip and I had no idea what all these bets were. The instructions spelled everything out really nicely, so I felt that I could bet like a pro. There was also information on each horse, so you could make a more informed bet. First of all, there are 3 tabs at the top left corner of the screen on the slots.lv website. These are “Bet”, “Bet Slip”, and “Bet Form”. The Bet screen is where you place your bets. You can make up to ten bets a race at up to $250 pet bet. After you make your bets, click “Begin Race”. If any of your bets paid off, your Bet Slip will be displayed showing which bet(s) won and how much money you won. 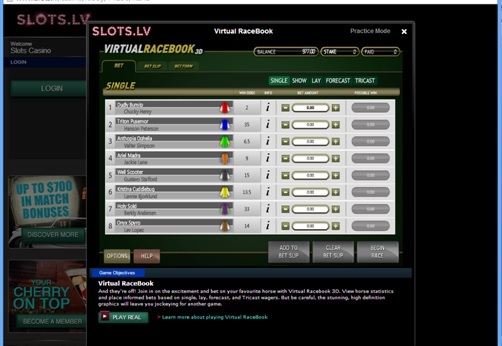 Let’s discuss the different types of bets you can make playing Virtual Racebook 3D. First, there’s the Single Bet in which you choose the winning horse. Then, there’s the Show Bet in which you choose a horse that you believe will finish in 1st, 2nd, or 3rd place. The Lay Bet is the opposite of the Show Bet. The Lay Bet has you choose a horse that you do not think will finish in the top 3 places. The next type of bet is a Forecast Bet (also known as an Exacta Bet). In this type of bet you choose which horse will come in 1st and which will come in 2nd. There are radio buttons next to each horse for you to make your selections. You can also play a Reverse Forecast Bet at the same time in which you switch the order of those horses in 1st and 2nd place. A Tricast Bet (also known as a Trifecta Bet) is a wager in which you choose 1st, 2nd, and 3rd place horses. Finally, there’s the Box Forecast. After you place a Forecast Bet you can click on the box to make it a Box Forecast. A Box Tricast would mean that you are betting that those three horses will finish in the top three. It’s a bit more specific than that, though. Essentially you are placing six different wagers that speak to 6 different finishing patterns of those 3 horses within the first three spots. The picture above displays the Bet screen. This is where you select what kind of wagers your making, and on what horses, and how much. The odds for each horse are listed to the right of the colored jersey, and of course they change when you select a different type of wager from the top of the screen. For information on each horse, click the “i” next to each horse, or go to the “Bet Form” tab. To place a bet, click the plus and minus buttons next to the horse, and click “Add to Bet Slip”. Once you’re done making you wagers, you click “Begin Race”. The screen then switches to the horse track where you get to watch the ponies compete! Once the race is over, your Bet Slip showing your wins/losses is displayed. I thought this game was a real thriller. I could really get into this, checking these horses’ stats and determining the best type of wager to make on each horse to maximize my winnings. This is my new favorite side game, taking a close second place to my online slots. The 2013 NFL season is underway and now is as good of a time as any to give you advice for placing bets on the game. If you saw the first week of the regular season, then you will understand that it is not easy to make the right picks against the spread. Let me recap Week 1 of betting on the NFL games. The NFL season opened with Baltimore at Denver. The majority of gamblers bet on the underdog Ravens, who were receiving 9 points even though they were the Super Bowl champions. The Broncos blew them out in the 2nd half on the strength of 7 TD passes from Peyton Manning. That chased a lot of gamblers away from betting on the dogs for the rest of the week. Unfortunately for these gamblers that bet on the favorites, they were taken to the cleaner for the rest of the week. There are several of the bookmakers that will publish what percentage of bets are placed on a certain team. Of the games that had over 75% of the wagers on the favorites, the following teams did not cover: New England Patriots, Indianapolis Colts, Tampa Bay Buccaneers, Pittsburgh Steelers, Washington Redskins, Houston Texans. The only two favorites in this category that won was the Seattle Seahawks and Kansas City Chiefs. Underdogs overall went 9-7 in Week 1. This lets you know the importance of placing wagers on the dogs to cover. I know a several gamblers that primarily pick favorites to cover; this is even after they know the fact that both sides are win about 50% of the time (the oddsmakers are very good at setting those lines). More often than not, these favorites bettors have a couple of terrible weeks each year that crush their bankroll. If you are going to bet on NFL games, here are some of the things that you should note so you have a better chance at winning in the long run. If you don’t have a bankroll when you are betting, you better only be placing wagers for fun. Establish a bankroll if you are going to bet week in and week out. This bankroll should be at least $1,000. Your average bet on the early Sunday games should be no more than 5% of your total bankroll. If you are planning on betting $100 per game, you better have a bankroll of $2,000. You shouldn’t have more than 15% of your bankroll in play at any one time. Don’t bet more than 3 games at the same time. If you plan on betting on the spread and the total for a game, bet 2.5% of your bankroll on each wager. If you ever lose 15% of your bankroll in a given day, you should be done betting for the week. Once the early games are done, you should know whether or not you can up the amounts of your wagers for the afternoon Sunday or Sunday Night games or whether you should keep the bets the same amount. If you are on a winning steak, don’t be afraid to strike while the iron is hot. Take the first group of games on Sunday and rank them from highest to lowest in your confidence level. Only place bets on the teams that you feel you have a better than a 65% of winning. If you can’t find 3 games to bet on, only bet on 2 games. The same thing applies to the late games. If there are only 2 or 3 games being played, you may only want to place a bet on the game you feel most confident in playing. Should you bet on the Sunday Night or Monday Night game? If you are winning overall on the day, I would say that you should place that bet, unless you are completely unconfident about the game. The same thing applies to the Monday Night game. If your bankroll is up overall on the week, place the bet unless you don’t like the spread. Here are the things that they won’t tell you: 1) Don’t call from you phone unless you want to get spam text and unsolicited calls for years to come. 2) We don’t tell you, but we give half of the callers one pick and the other half the other pick. 50% of you will love our service. 3) We aren’t really 16-2. Nobody verifies this information. 4) Anybody that has a record of 7-1 or less than 10 games that can be verified is only being used because he is the new shill that is being advertised. Do your own research! The biggest thing to consider are the defense vs offense matchups between the two teams. The other big thing to consider are the recent injuries and backup players being used as starters. Most good teams will exploit these backups whenever possible. If you have the #3 passing offense against the #25 passing defense, this is a good thing to know. It won’t guarantee anything, but it will help your confidence with the bet. #4 – Bet on the Underdogs! San Diego at Philadelphia (-7.5) – over 85% of bets on the Eagles. Philly couldn’t have played a better 1st half and the Chargers couldn’t have played a worse 2nd half. I have the Chargers covering this. Cleveland at Baltimore (-7) – almost 95% of bets on the Ravens. Baltimore’s defense is in trouble this year. The Broncos may have a great offense, but the fact that Baltimore didn’t stop them for a field goal once is a big clue. The Browns may not cover and I’m not going to bet this game. St Louis at Atlanta (-7) – over 90% of bets on Atlanta. A lot depends on whether Roddy White is going to be healthy enough to do well in this game. The Rams aren’t a bad team and I think that this spread is too high. Atlanta’s offense can still blow teams out, however. New Orleans (-3.5) at Tampa Bay – over 90% of bets on the Saints. This game is a huge red flag. Everyone is going to think that the Saints are going to win going away, but I don’t think so. These two teams usually play really close games in Tampa. Detroit (-2) at Arizona – over 90% of bets on the Lions. I have the Lions losing this game. Arizona is underrated and Detroit constantly shoots themselves in the foot. If Minnesota had a decent offense, they would have lost the first game at home. Jacksonville at Oakland (-6) – almost 90% of bets on the Raiders. Having Oakland as a 6 point favorite is troubling. Blaine Gabbert was throwing with a broken hand and Chad Henne should start. Indy didn’t play well at all against the Raiders. I have Oakland winning by a field goal. Pittsburgh at Cincinnati (-7) – over 75% of bets on the Bengals. Pittsburgh is still going to have problems on offense, particularly with the running game and pass protection. This is one game where I would actually bet on the favorite. However, Pittsburgh usually plays well on Monday Night. It isn’t surprising to see all of the favorites being bet heavily early on. The traditional wisdom is to bet the favorites early before the line is bet higher. You bet the underdogs a couple of hours before the game to get the best value on the line. Line shopping only works if you have a player’s account at multiple sportsbooks. The idea is that different sportsbooks will have different spreads and different lines. You can find a line at one sportsbook for this Thursday Night game where the Patriots are an 11 point favorite at home against the Jets. The line is -110 ($110 to win $100) or even money plus the juice. You can find this same game listed as a 13 point favorite with the Patriots receive +110 ($100 to win $110) on the line. If you have the Patriots winning by 2 TDs, you may want to opt for the better line. If you don’t like the higher spread, you may want to bet with -110 line. This is all subjective to what your preference is. Nobody offers “the best odds” or “the best NFL lines” because they don’t know who you are going to bet on. You want to place your bet on the spread and line that gives you the biggest advantage.